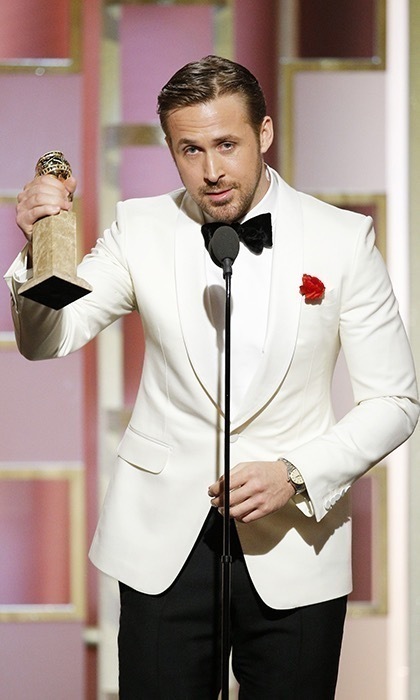 Throughout the recent awards season, Hollywood spectators noticed the absence of Eva Mendes from her partner Ryan Gosling’s arm. Now in an interview with Shape magazine, the mum-of-two revealed why she did not hit the awards-circuit red carpets. "What people don't know about me is that I love being home," the 43-year-old confessed. "Instead of hitting the red carpet, I'd rather be with our girls." Ryan, 36, and Eva share daughters Esmeralda, two, and Amada, 11-months. The notoriously private couple secretly welcomed their second child together last spring. The actress admitted to the magazine: "In some ways, it's been more challenging to get back in shape after my second daughter.” She added: "Yet it's not as hard as I thought it would be, because I'm always running around with the kids. I never sit down -- I'm on the move all day. And I don’t keep junk food at home anymore, because I’m trying to set a good example." While Eva wasn’t to present to witness her longtime love’s first Golden Globe win in January, the La La Land actor gave the mother of his children a sweet shoutout in his acceptance speech. "You don’t get to be up here without standing on the shoulders of a mountain of people," the Golden Globe winner said. "And there’s just no time to thank everyone I just would like to try and thank one person properly and say that while I was singing and dancing and playing piano and having one of the best experiences I’ve ever had on a film, my lady was raising our daughter, pregnant with our second and trying to help her brother fight his battle with cancer," Ryan continued. "If she hadn’t taken all that on so that I could have this experience, would surely be someone else up here other than me to today. Sweetheart, thank you."